THE ADVENTURES OF FU MANCHU (1956) begins with Fu Manchu (Glen Gordon) and his archrival Nayland Smith playing a game of chess with the narrator telling us, “Black and white. Life and death. Good and evil. Two sides of a chess game. Two forces of the universe, one magnificent, the other sinister. It is said the Devil plays for men's souls. So does Dr. Fu Manchu, Satan himself, evil incarnate.” The ruthless Fu Manchu commits murder in the search for gold and then helps Adolf Hitler get plastic surgery so that together they can conquer the world. In THE CASTLE OF FU MANCHU (1969), super-criminal Fu Manchu (Christopher Lee) plots to freeze the world's oceans and create monumental catastrophes with a diabolical new device. 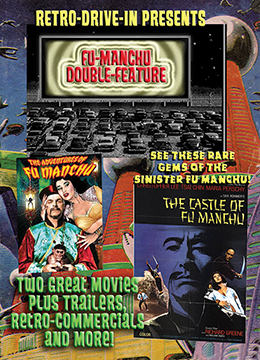 With his evil daughter, Lin Tang, his army of dacoits and the help of the local crime organization led by Omar Pasha, Fu Manchu takes over a governor’s castle in Turkey so he can to control the largest opium port in Anatolia, which will fund his evil plans and house his machine of destruction. He needs the help of a scientist with an ailing heart whom he has imprisoned and kidnaps a doctor and his wife to give him a heart transplant from one of his obedient servants. Opposing him from Britain's Interpol, are his nemeses Nayland Smith (Richard Greene) and Dr. Petrie. Can anyone stop the diabolical Fu Manchu?